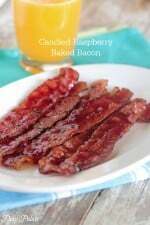 My Candied Raspberry Baked Bacon could not be more simple to prepare and irresistibly delicious! 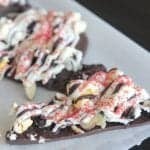 If I could jump up and down with excitement telling you about this recipe I would! These drool worthy strips of sweet and salty bacon are heaven sent. 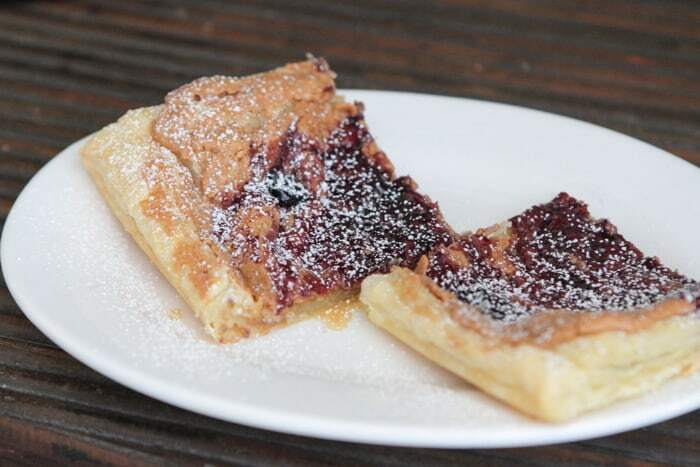 I’ve partnered with Smucker’s to bring you simple recipes that use their amazing jams and preserves. You won’t believe how simple this recipe is! 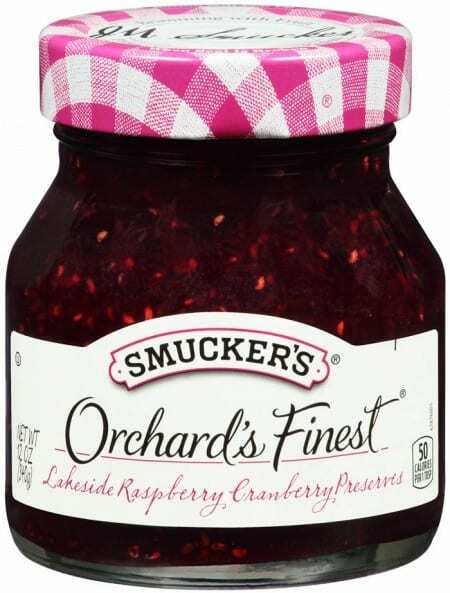 If you haven’t tried Smucker’s Orchard’s Finest Lakeside Raspberry Cranberry Preserves you’ve got to! Sooo good. Be sure to visit Smucker’s on Facebook and their Perfect Pairings Board on Pinterest. I love pairing cheeses, crackers and nuts with a little bowl of my favorite Smucker’s preserves for dipping. I also love serving pita wedges with peanut butter and Smucker’s preserves for a midday and or after school snack. Take 1 pound of cooked bacon strips (I used the microwave ready bacon strips) and brush each lightly with your preserves then sprinkle lightly with brown sugar. Place in the oven and let the magic happen! 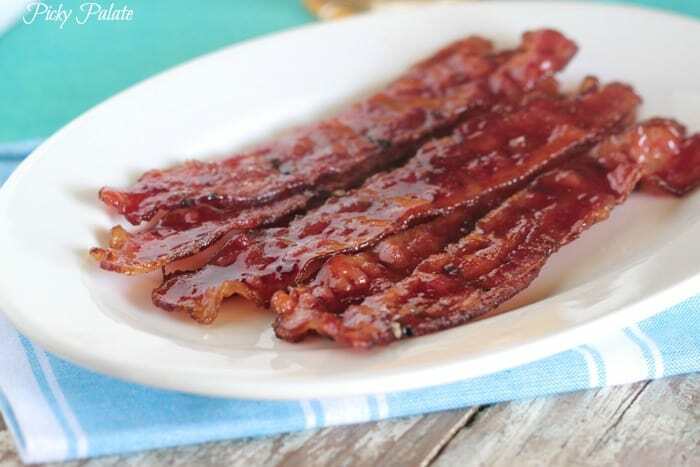 Crispy fabulous candied sweet and savory bacon strips! Preheat oven to 400 degrees F. and line a large baking sheet with a baking rack. 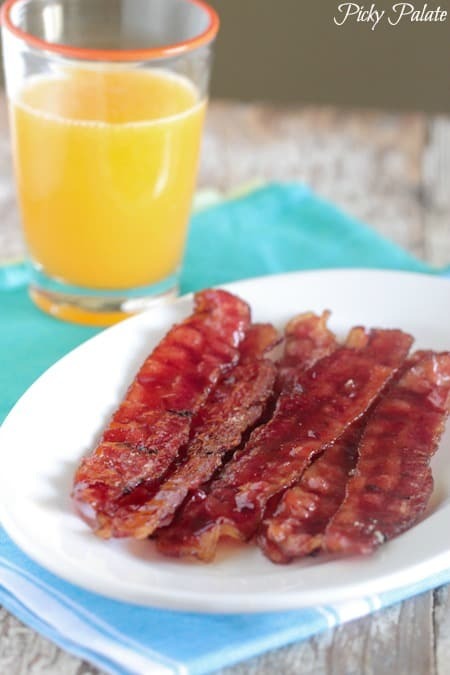 Arrange bacon strips onto baking rack and brush evenly with preserves. Sprinkle with brown sugar and bake for 10-15 minutes or until browned and crisp. Remove and let cool for 20 minutes. Serve room temperature. Here’s another fun and simple recipe that is great for an after school snack and uses Smucker’s irresistible Blueberry Preserves! Hope you enjoy! Preheat oven to 350 degrees F. and line a large baking sheet with a silpat liner or parchment paper. Unroll puff pastry sheet and gently press onto baking sheet. Spread with peanut butter then Smucker’s Blueberry Preserves. Top with chopped peanuts. Bake for 25-30 minutes until pastry is puffed and golden. Remove and let cool for 10 minutes. 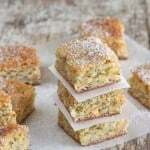 Cut into squares and dust with powdered sugar before serving. This is such a fun idea!! I definitely need to give this a try. LOVE Smucker’s jam! And this is probably the most creative way I’ve ever seen jam made into a recipe! 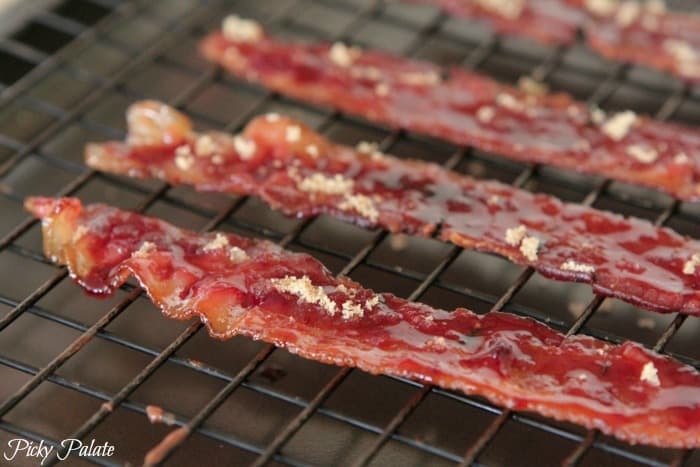 Candied bacon – definitely need to try this. Pinning! Josh and Caleb will love this bacon! Love candied bacon! Especially a raspberry flavor!! Like your idea a lot, that must taste so good. Ok, that bacon?! Are you serious!!! I am trying to LOSE weight! ha! Looks yummy….did you use already cooked bacon? This is VERY creative Jenny! I am totally intrigued! Baked bacon is the best. I’ll have to try it with jam. What brand of precooked bacon strip did you use? The ones I previously have tried would not make it past 5 minutes in an oven at 400° without burning as they are so tissue thin. This recipe sounds really good but not so good for my diet. But I can cheat every now and then. Thanks for sharing. Well, this bacon just made today an 11/10 situation. So much goodness! I’m jumping up and down for this recipe! Holy cow, it sounds seriously amazing! You had me at bacon – this looks so fantastic!! Um this is amazing! I love the raspberry! I am salivating just thinking about this bacon. I’ll bet it would be awesome crumbled over a melted Brie crostini. Will this work with uncooked bacon?